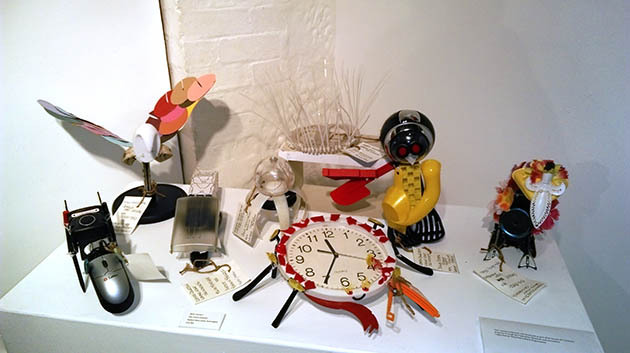 I really wanted to share some photos of work at the Art From Trash exhibition which ends next week. Some of these photos were taken by myself but most were taken by the official photographer and I got them off the Art From Trash facebook page. Please visit their page to see more work. I mostly just wanted to share the works that Wayne and I entered or have connection with through our jobs. Firstly, here are Wayne’s entries. 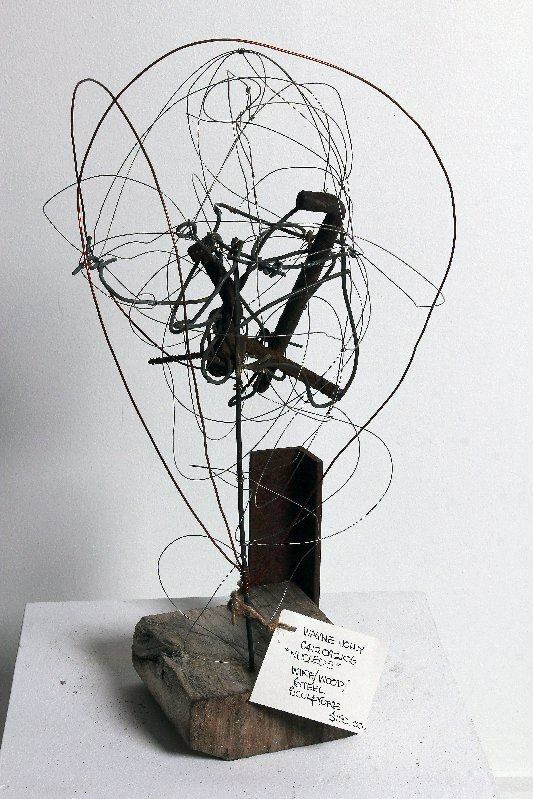 This one is called Nucleus and is made of old metal, wire and wood. It looks best in the sunlight with the sun glinting off the silver and copper wires, contrasting with the rust and old wood. Its approximately 45cm tall. This one is called Big Bang and is over a metre tall. 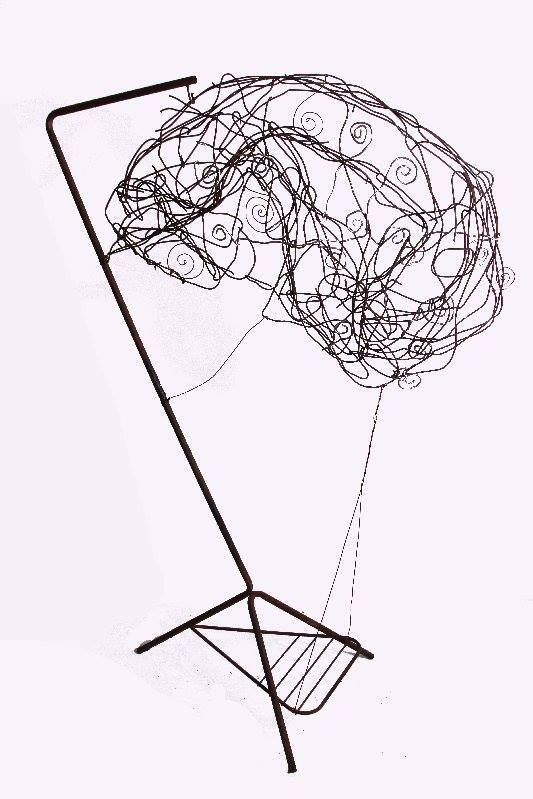 Its free standing and is also made of different wires and metals. You can’t tell in the photo, but there are silver and copper wires all mixed in together with rusty metal. Photos don’t do it justice. You’ve seen this one before. 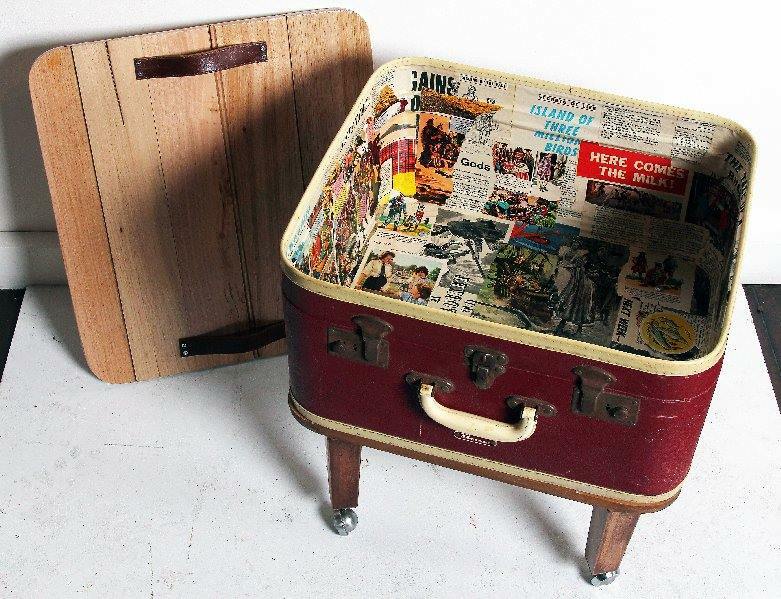 Its my Travelling Sidetable. 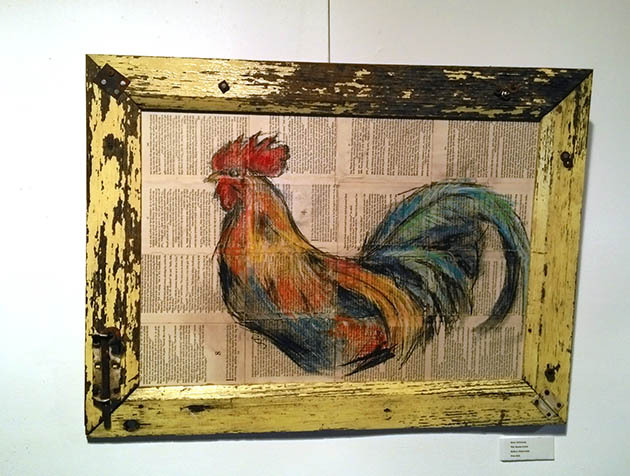 And of course, my Rooster In Print. 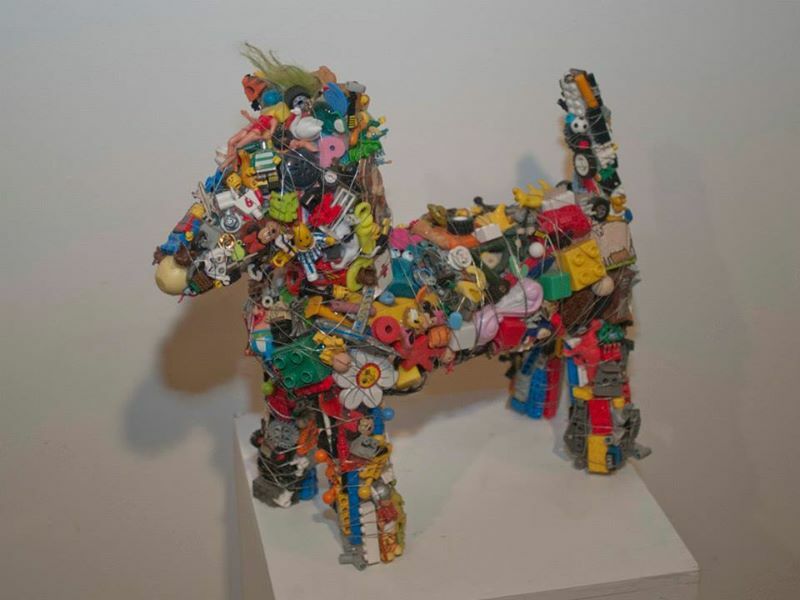 This is the Cosmos Collection, a collection of animals made from plastic and other ‘junk’. 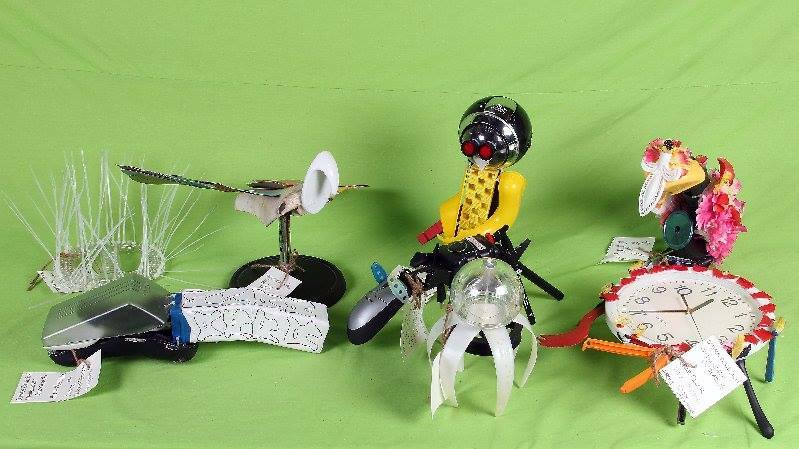 These were made as part of ‘making art from trash’ workshops run at Cosmos (where Wayne and I work) in association with the Tasmanian Art Gallery. 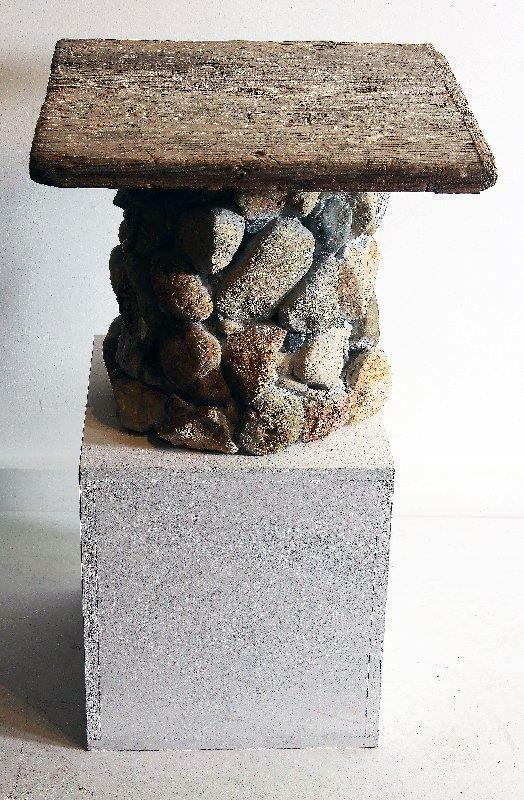 Another Cosmos entry in the AFT is this Rock’n’Table, made by participants in our art programs. Obviously made of rocks and a slab of old wood. Below is the work of a guy I tutor in art privately. Sam Bosworth is a very talented young man with autism and I love working with him and watching him develop his wiring skills. 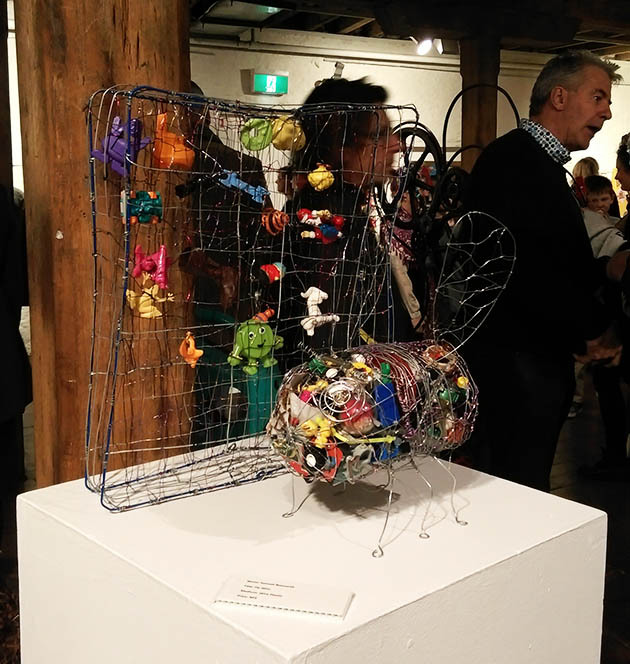 This entry is called Fly Wire and is made of old coat hangers, old plastic toys and wire. You can’t really see the many different coloured wire in the pieces. 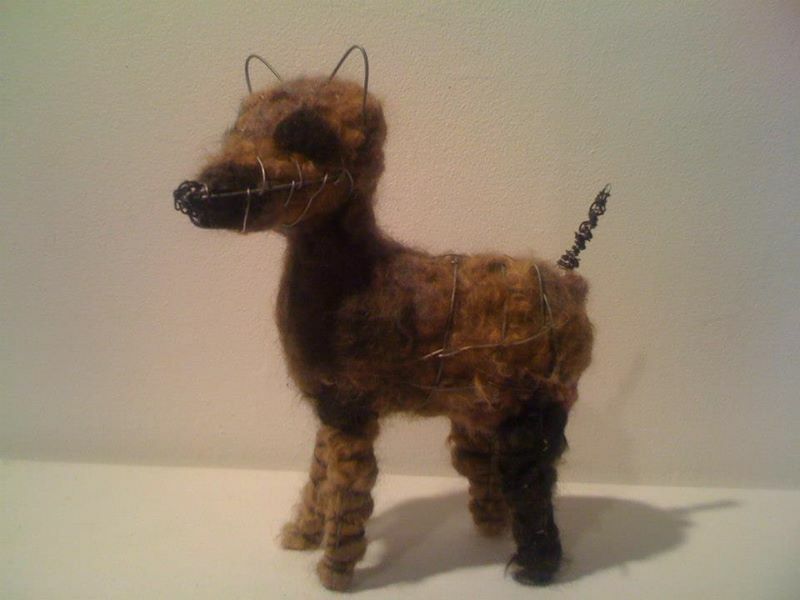 And in case you missed last year’s AFT, these were my entries – the Junkyard Dogs. 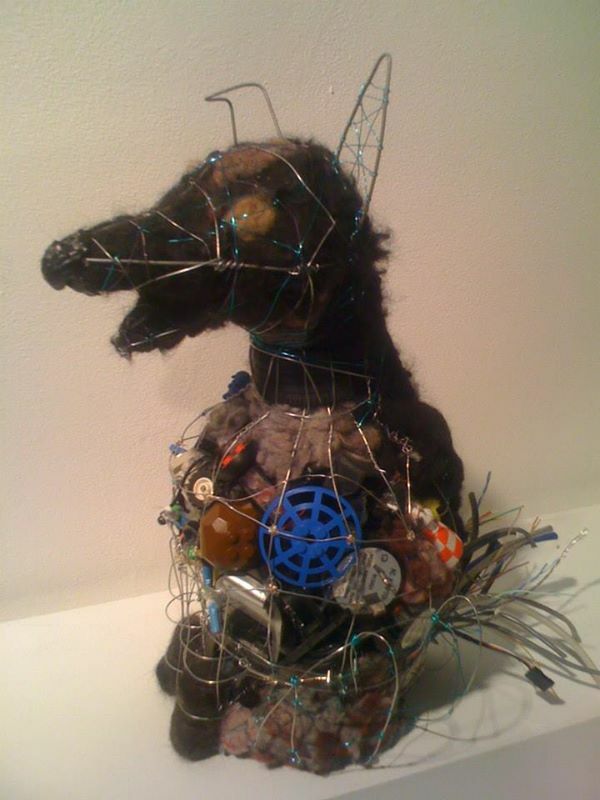 This little guy is made of wire, plastic toys, dog hair and electric cables. 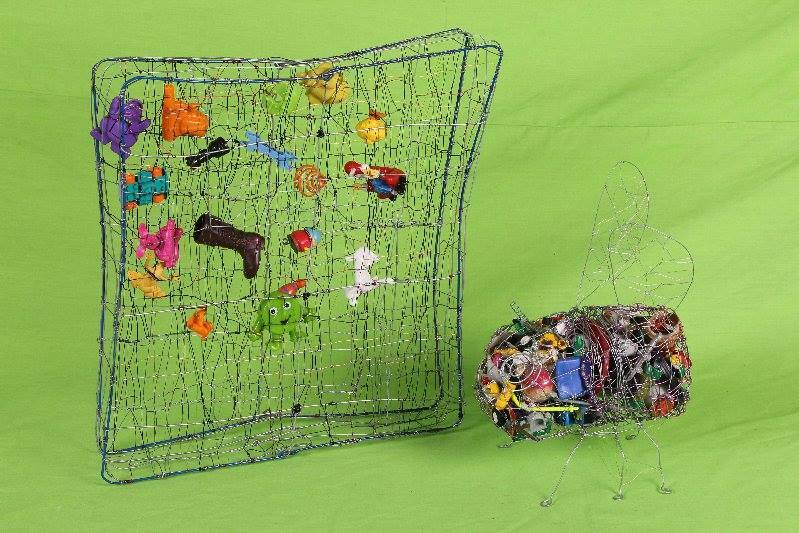 This guy is plastic toys and wire. 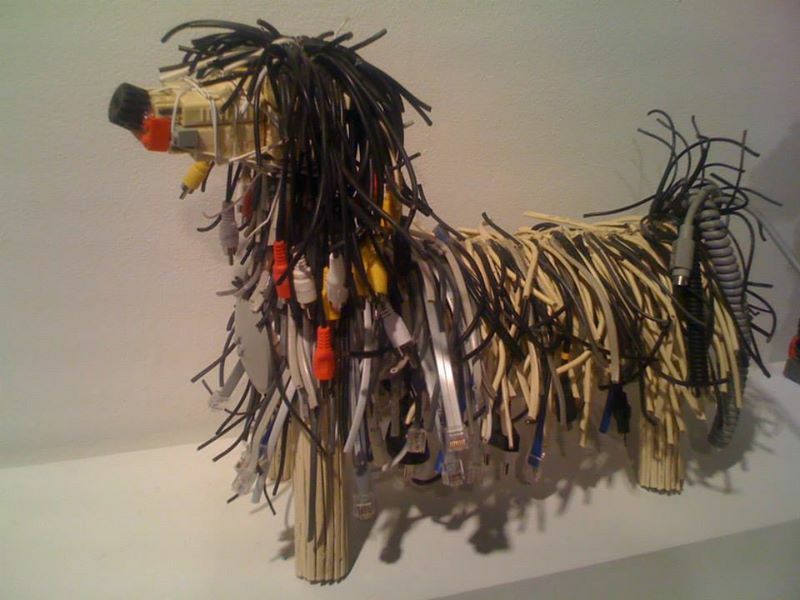 This one is old cables and cardboard. Lastly, the smallest in the bunch, wire, dog hair and a dash of possum hair and dryer lint. I’ll leave you with a fun one – this is one of last year’s Cosmos entries. 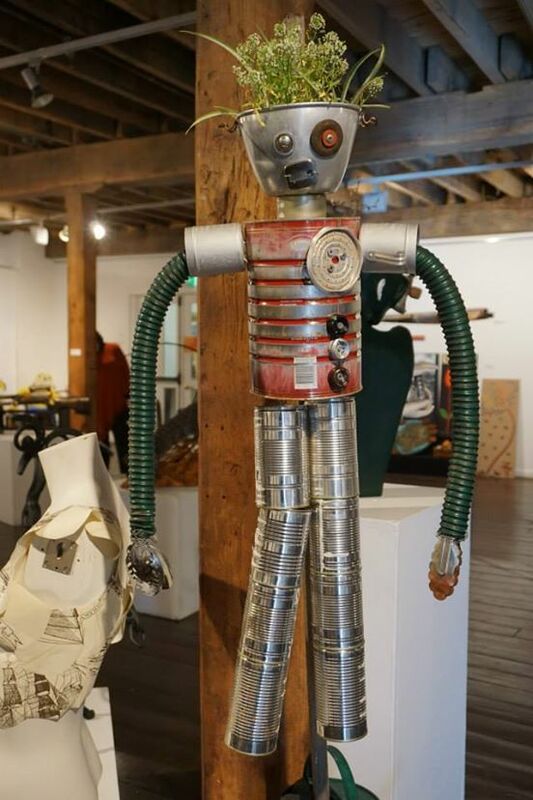 The Tin Man was something I assisted one of our participants to make. So much fun! That’s the best part of my job: working with people with disabilities to create art.